What will Bed Race theme be for 2019 for Harrogate district teams? Flashback to Knaresborough Bed Race 2018 - Ripon Runners, who won The Fastest Ladies Team award. Knaresborough Lions has unveiled the theme for next year's annual Great Knaresborough Bed Race. Teams from across Harrogate district for the 54th Bed Race will be invited to celebrate everything that Yorkshire has contributed to the world in general and to the good folk of ‘God’s county’ in particular. The 2019 Great Knaresborough Bed Race with the theme of 'Yorkshire' will be staged on June 8, the second Saturday in the month as always. It 54th running of this spectacular event, which is renowned far and wide for being part fancy dress carnival, part grueling athletics contest, which has never called off come hell or high water in the River Nidd. Richard Hall, chairman of Knaresborough Lions’ organising committee, said:"Knaresborough Bed Race is massively popular and looms large in the calendar of the whole county. “It attracts competitors and spectators from around Yorkshire and is a red-letter day for Knaresborough itself. “The two parts of the event – the dressing of the beds in the theme and the time trials around the scenically outstanding 2.4-mile course - makes this race the very special event that it is. “In announcing ‘Yorkshire’ as the 2019 theme we are marking how Bed Race typifies those Yorkshire traits of grit and eccentricity, sporting endeavour and a love of cross-dressing!" Organisers are also hoping that, being the largest county by far, the creators of the bed designs will cast their imaginations far and wide to come up with original and witty interpretations of the theme for the parade down the High Street. The Great Knaresborough Bed Race is an event staged by volunteers from the Lions club to raise funds for charities and community needs. Apart from the 90 teams of six runners and a passenger which take part, 300 local people help with organisation on the day. The event attracts 30,000 spectators each year and garners TV coverage around the world. 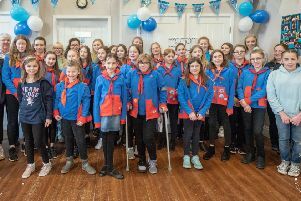 It has spawned events in many other countries and the Knaresborough Lions have done much to foster the spreading of the event. Entry forms for the teams will appear from January 1, 2019 on the event website www.bedrace.co.uk, and have to be filled in and returned to the Lions club before the end of February. Harrogate school to get new 3G pitch?